MissionThe F-WordGet RealTrust MeOn TrendKeep UpCheers to ThatCheck Her Out Resources Organizations Podcasts ShopYou In? Here is a fact that might blow your mind: the European Union bans 1,328 types of chemicals from cosmetics that are suspected to cause cancer, birth defects, genetic mutations, as well as chemicals that affect a woman’s hormones. Today, the United States only bans 11 dangerous ingredients and chemicals from our cosmetics. Yes, you read that correctly -- that makes 1,317 chemicals still allowed in our cosmetics. EU law requires pre-market safety assessments of various chemicals and prohibits animal testing for cosmetic purposes, but the U.S. does not. The beauty industry is massive in the United States, with an approximate worth of $445 billion. The average American woman applies on average 12 products per day. Obviously, there is a huge lack in regulation in this industry. While I do believe the government should never overstep its’ boundaries, I contend that they should have the public’s interest and protection as their number one priority. There are numerous, proven bad ingredients in our everyday, conventional products. Every time you swipe on deodorant that contains aluminum, put baby powder on a baby that contains talcum powder, or lather up with your favorite shampoo that contains formaldehyde, you are putting yourself and your loved ones at risk. We should not live in fear every day; it is so important to be aware of these harmful ingredients that creep into our everyday lives through our favorite products. After joining on with Beautycounter as a consultant, I was able to learn and value safer choices. I have been left feeling disappointed in some of my lifelong, favorite brands when I come to learn certain ingredients that they use to formulate their products. 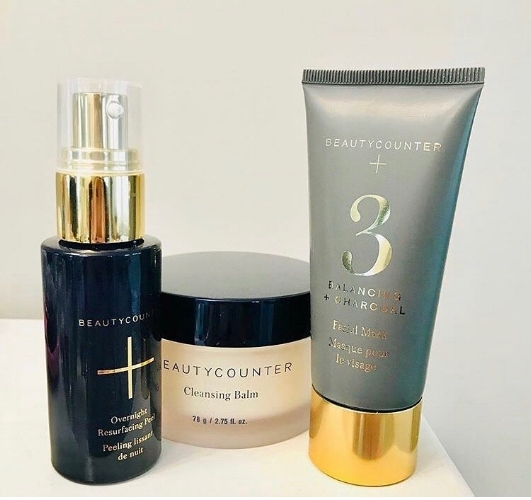 Beautycounter is a beauty and cosmetic brand that not only creates safe products with verified ingredients, but they advocate for safer skincare products for all. Their overall goal is getting safer products into the hands of everyone. Not only do they promote their products, but they promote switching to safer choices in your home and daily life. I was taught to not live in fear, but to be cautious. The company introduced me to an app called “EWG” (Environmental Working Group). The app is a simple step you can add into your life to ensure that the choices you are making in the store are safe choices. You simply scan the barcode or type in the name of a product, and it pulls somewhat of a “report card” on the product. It ranks the ingredients, lists the possible side effects of those ingredients, and serves as a great tool for purchasing safer alternatives. Will Beautycounter or any skincare company give you absolutely flawless skin? No! I have struggled with those pesky blemishes throughout my life, and on the other hand, there are some people who literally wash their face with a bar of soap and have near-perfect skin. What I have learned is that it is so much more than just skincare. For me, food and my environment play a huge role in my skincare routine. No amount of beauty products can fix what is going on in the inside, but my safer beauty choices have allowed me to nourish my skin and give it what it needs while cutting out the junk! Safer skincare choices play a huge part in your overall health. I dare you to seek the truth in your everyday products!